Look at it this way: If you were an institutional investor in paper gold contracts, would you want to buy them from the comedians, even at depressed prices, if you knew that your chances of getting delivery on them when it counts are virtually nil? Would you buy them if you knew that, the more time passes and word of the physical gold shortage gets around, more and more other institutional investors like you will likely stop buying them and possibly sell theirs instead because they know they couldn’t get any gold for them even if they wanted to? The only reason anyone buys futures contracts for gold at any price is the belief they could take delivery if they decided to do so. Never mind the fact that most of them wouldn’t dream of taking delivery under normal circumstances, but these mounting rumors of shortages are sure to take a toll on their tender psyches. For that reason, a very possible, even likely, scenario from here on out is that the Comedian’s Exchange theoretical price of gold and silver will continue to go down even as premiums for physical delivery at gold dealer outlets are rising. As noted last time, James Turk reports in his latest Commentary that 1000 oz LBMA gold bars are still available at these hilarious prices. For how long do you think that will last? Probably not very long. Those who get theirs now and who take advantage of the ability to buy fractional shares in these bars backed by a full delivery guarantee at current comedian prices will be very happy in the future. As for silver, for how long will the industrial users be able to get delivery at current prices? For how long can their colleagues at the CFTC guarantee them this preferred treatment? If Indian banks can’t even get gold at this time, will the Silver Users Association be able to avoid the same fate? If so, for how long? Will they be able to find a way to use their futures contracts in their manufacturing processes? How about Gold and Silver ETF’s? Is it a good idea to buy precious metal ETF shares now, given that they can still get LBMA bars at COMEX prices? Well, I would be interested in knowing how I can verify that they are not supplying the industrial market with cheap silver, for example, from their alleged holdings. If they are later found to lack the actual metal during an audit, how much will their shares be worth then? How about gold mining companies? Can they come to their senses and refuse to supply the market with gold at illusory prices? Other than whatever they are obligated to sell cheaply under their hedging contracts, they should be able to. As time goes on, they may have to. When will they start? No one knows. We only know that when they do, there’ll be hell to pay for the bullion banks. They already can’t (or won't) supply Indian banks with gold at these prices. What will have to give will probably be the grip of the comedian’s guild at the New York Mercantile Exchange. If I was them, I would gradually allow the price of paper-promises of theoretical future metal delivery to rise so it won’t diverge too far from the real price that real people are willing to pay for real metal – or else they will soon lose all of their cherished control. If they don't, nobody will want to buy their paper anymore. Maybe the relatively new Dubai gold exchange will have better sense and use this chance to succeed the Comedians as "the" price-setting exchange of the world by simply being real? Or maybe Shanghai would like to enjoy that position? Who knows? 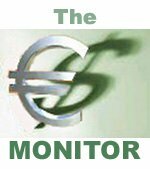 In any case, if you have heeded the Euro vs Dollar Monitor’s advice over the years and stayed away from paper gold and bought physical, only, you ought to be sitting there, rubbing your grubby little hands together at this point. You’ve already had your payday. Now, it’s time for the rest of the world to pay – for your gold, should you choose to sell it. You will soon have the luxury of picking your own price.